(۳) ایسے کھانے کو کھانا کیسا ہے؟ قرآن وحدیث کی روشنی میںم دلل تحریر فرمائیں. Whosoever vacillates between different schools of thought (madhabs) in Islam and follows the way of anti-madhabism is worse and more abased than any of the aforementioned cases. Each branch of knowledge can have multiple schools of thought such that in a given branch the specialists can have differences of opinion. He who claims to be a philosopher without belonging to any particular school should in fact be considered foolish and thus can only belong to the school of fools not of philosophy. Those who are considered to be founders of a given branch of science and who have documented their views have their own ways and principles. Take for example the study of the Arabic language. There are principle sources for this science, that he who would like to sip from their fresh spring, cannot be unaware of nor can he be blamed for having clinged to them. From the dawn of Islam until our day there is not a single branch of knowledge among the [Islamic] sciences that has gotten as much attention from the scholars as did the science of jurisprudence (fiqh). Prophet Muhammed (Sallallahu Alayhi Wasallam) used to teach his companions jurisprudence and train them to derive rulings from the sacred texts until six companions were able to issue legal verdicts (fatwa) during the Prophet’s (Sallallahu Alayhi Wasallam) lifetime. After the passing of the Prophet (Sallallahu Alayhi Wasallam), his companions used to learn jurisprudence from these six scholars. They had students not only among the companions but also among the followers (tabi’een) who had reached a level such that they were licensed to issue legal verdicts. Madinah was the cradle of Revelation and the dwelling place of the majority of the companions until the end of the reign of the third rightly guided Caliph [Uthman (Radhiyallahu Anhu)]. Many of the inhabitants of Madinah [took advantage of the presence of the great number of companions and] collected many of the prophetic traditions (hadith) or legal verdicts from the companions until seven [famous] jurists [among the followers] of Madinah gained worldwide fame in Islamic jurisprudence (They are Said bin Al-Musayyab, Urwah bin Zubair, Al-Qaasim bin Muhammed bin Abi Bakr Al-Siddeeq, Abdullah bin Utba bin Masood, Khaarija bin Zayd bin Thaabit, Sulaiman bin Yasaar and Abu Salama bin Abdurrahman bin Awf. May Allah be pleased with them all). [The follower] Said Bin Musayyab was so famous for his vast knowledge of the verdicts of the companions that even the great scholar Ibn ‘Umar (Radhiyallahu Anhu), would query Ibn Musayyab about the verdicts of his own father ‘Umar (Radhiyallahu Anhu). The knowledge of the aforementioned scholars was then transferred to the teachers of Imam Malik in Madinah. Imam Malik collected this knowledge and started spreading it. The foundation of both the school of scholars of Madinah and its branches is attributed to Imam Malik. Many great scholars who came after him chose to follow his wise approach due to the strength of his proofs. Because of their own expertise and cleverness, if the great followers of the Imam had wanted to establish another school, they would have been able to do so and many people would have followed them. However, they humbly preferred to be the followers of the scholar of Madinah and keep the ummah united. They knew that in some cases weak verdicts were attributed to the Imam of the madhhab and so they had qualified scholars within the madhab research and replace the weak verdicts with up to date and well-grounded verdicts [as new hadith compilations became available]. Eventually, all the weak views were replaced with verdicts that were so well-founded, that any latecomers who attempted to poke holes in the school of Imam Malik would only embarrass themselves. The door of the city of knowledge that is ‘Ali (may Allah make his face noble), took it upon himself to continue from where Ibn Masoud left off such that no other city in the Muslim World could compete with Kufa in terms of the number of jurists, Hadith scholars, linguists, and people who focused on Islamic sciences. This happened after ‘Ali (may Allah make his face noble) moved the capital of the caliphate to Kufa which drew many of the most well-educated people there. Al Ijli mentioned that 1500 companions settled there. This is in addition to those companions who would travel from place to place in Iraq to spread knowledge. A scholar of such caliber [Al Shabi] used to prefer Al Nakhai over all the other scholars. Anas bin Sireen said, “I entered Kufa and there were 4000 people studying hadith and 400 studying jurisprudence.” This is narrated by Al-Ramahurmuzi in his book “Al-Faasil”. After Abu Hanifa, came Imaam Al-Shafii (may Allah be pleased with him). Al-Shafii gathered knowledge from the students of the companions and added to it what he learned from his teachers in Makkah (His teachers include Muslim bin Khaalid who has gathered his knowledge from Ibn Jurayj who was a student of Ataa who was a student of Ibn Abbaas). [The knowledge of Imaam Al-Shafii spread quickly such that] the East and the West became filled with his students and also the students of his students who went on to fill the world with knowledge. Egyptians are some of the most familiar people with Imaam Al-Shafii as he settled there towards the end of his life and established his new school before he passed away there (may Allah have mercy on him). There are many other jurists but this is not the occasion where one can list the virtues of all who have contributed to the development of Islamic jurisprudence. All the [independent jurists (fuqaha)] agree on two thirds of issues. On the one third where they differ, the approach they have taken and the evidences they have used have been recorded in authentic books in each school of thought (madhab). This is how the schools of thought have been established on strong foundations. If you come across, at the end of time, these obtuse, cocky, anti-madhab individuals who don’t belong to any school of thought, who claim to be scholars without any ground to stand upon except their own burning desire to attain fame and notoriety, and who call for the abolishment of madhabs and want to replace with them with their own ignorant verdicts (ijtihaad), as a follower of a madhab you will be hard-pressed to make any sense of any of this. Are they insane and should they be sent to an asylum? It will be difficult to decide if they are the insane ones among the intellectuals or the intelligent ones among the insane individuals? In recent times we are hearing calls of this nature from some people. Before we respond to their claim that there is a need to do ijtihad that will do away with the madhabs, we need to have them checked by psychiatrists to make sure that they are sane. Assuming that they are somewhat sane, they must be part of the plot of the enemies of this monotheistic religion. Among the aim of the plot is to divide the Muslims both in religious and in worldly matters. A division that will lead to quarrels, dispute, and hatred day after day when Muslims have been gathered under the unifying umbrella of brotherhood since the dawn of Islam until this day. When an acute Muslim spots such an individual, he will find that this so-called scholar shares nothing with Muslims in terms of their hopes nor worries except as theatrics. He will find this charlatan befriending the very people that Muslims shun. He will find the so-called scholar declaring a war against everything in our heritage as archaic except for that which is imported from the West where the sun of virtue sets. Such individuals commit these (heinous) acts in order to get approval from their puppet masters [among the enemies of Islam.] When an acute Muslim spots such an individual spreading mischief among us he should alert the authorities so that we can be saved from the mischief maker’s evil doings. The truth is above everything. Those who call people to stop following the independent jurists could consider all the verdicts of all jurists to be correct such that no ordinary Muslim could follow any of the independent jurists in any given issue without necessarily sticking to the views of one of the imams. This is the view of the Mutazila (A deviant sect called “rationalists”). As for [some of] the Sufis, they effectively consider all the verdicts of the imams correct in that they like to follow the strictest verdicts from among the verdicts of the imams instead of sticking with one imam. This is what was pointed out by Abu Al Alaa Saeed bin Ahmad bin Abi Bakr Al Raazi in his book “Combining Piety and Legal Verdicts Both in Spiritual and Worldly Matters” when he mentions in the chapter of jurisprudence what necessitates legal verdicts and what necessitates piety among the sayings of the four Imams. He stated that what is done by Sufis is not following one’s desire rather it is piety itself. According to the view attributed to the Mutazila (A deviant sect called “rationalists” ), ordinary people are allowed to pick and choose among the verdicts of the imams. However, the least an ordinary Muslim can do is choose an independent jurist (such as the four imams) whom he thinks is most knowledgeable and pious and then abide by the jurist’s verdicts regarding all issues without seeking verdicts of various imams which suit his desire. As for haphazardly seeking out verdicts from various imams because they are more pleasing to us, this has no place in Islam no matter who issues a verdict claiming otherwise. Regarding the claim that all of the verdicts of the Imams are absolute truth, Al Ustadh Al Imam Abu Ishaaq Al Isfarayiini says, “This starts out as nonsense and may end up as irreligion.” In a given issue one Imam may permit it and others may prohibit it. How can both be right? He who follows all the verdicts [found in a school] of an Imam is not responsible for whether his Imam made a mistake or not. This is because if a judge issues a verdict and he gets it right, he earns two rewards. If he gets it wrong he earns one reward. There are quite a few hadeeth regarding this matter. From the early days of Islam until now there is a consensus [among the scholars] in the Muslim nation that one who imitates an Imam is not held culpable if his Imam makes a mistake [provided that he does his best in choosing a qualified Imam like one of the four Imams]. Had the Imams been liable in making a mistake while issuing a verdict they wouldn’t have been given a reward. We do not need to say more as al Ustadh Abu Ishaaq Al Isfarayiini has declared the truth [above] and one is able to bring a thousand and one proofs but this is not a place for it. If the one who is calling people away from madhabs believes that the madhhabs are the reason for the sects and conflicts in the Muslim nation and that the Imams, all of them, were wrong until now and that he alone is able to correct their mistakes and bring out the truth that was hidden from the Muslims for fourteen centuries- then this is foolishness and recklessness of the highest order. We hear about the anti-madhabists’ attacks on the authentic unitary narrations (Hadith aahaad) from the Sunnah, legal analogy, consensus of scholars, and widely accepted rulings derived from the sacred texts by the people of ijtihad. By attacking unitary narrations they denounce the books of hadeeth including the authentics, the sunnan, the collections (jawami’), the musannafat (Collections of hadith where the author compiled narrations without placing any restrictions on their authenticity), the masaneed (Plural of musnad. These are hadith books where the hadith are sorted by narrator). and the narrated Quranic commentaries and others. This means no verdicts can be derived from these sources nor any other benefit can be drawn. Who takes this way of the devil other than the instruments of the enemies of Islam? It must be pointed out that if a given unitary narration is narrated by multiple chains it can reach the level of unanimously agreed upon narration (mutawaatir) by meaning. In addition, if there is external evidence (muhtaffun bi al qaraain) supporting a unitary narration it must be taken into account. Some specialists consider the hadeeth found in the two authentics (The two authentic collections of Bukhari and Muslim) to have external evidence supporting them with some exceptions. By discarding the classical unanimous acceptance of the consensus of scholars (ijma’) they are eradicating (our great history) and inclining towards the misguided Khawaarij or Rawaafid. By refusing to observe legal analogy they close the door of issuing (modern) legal independent verdicts (taqwa) and incline to the way of Khawaarij, Rawaafid, and Mutezila who do not accept legal analogy [as one of the sources of Islamic law]. All of this is conspicuously taking place under the nose of Al-Azhar University and its scholars remain silent. Being mute in the face of such disgraceful behavior is not befitting of Al Azhar, which was built upon a foundation of piety (taqwa). During the reign of the King Zahir Al-Baybars and his benevolent princes, he and his princes made Al-Azhar a citadel of learning for orthodox Islam after they rejuvenated it. Since then all of the Muslim rulers have taken great care of this institution as did the founder until now (Ca. 1940). Its doors are still closed to those other than the followers of the four schools of thought. These rulers have spared no expense or effort for this noble cause. The king Fuad the first, may Allah have mercy on him, had a big role in keeping Azhar on its unshakable foundation of piety. Similarly the [current] government which adheres to the principles of Islam continues to be benevolent to Azhar [in order that Azhar continue to march on the straight path]. How will the proponents of absolute free speech prevent other zealots like the aforementioned one from becoming an independent jurist (mujtahid)? How will they impose their views on others depriving people of their freedom to choose? How can he who calls for absolute freedom deprive ordinary people of the right to decide for themselves which scholar from the golden age of Islam to depend on and imitate? Such prohibition or deprivation was not even seen during the dark ages!!! I must admit that I don’t have answer to the aforementioned question. In summary, if you research the situation of the proponents of the anti-madhabism you will find them most ignoramus blinded by the burning desire to be famous and to befriend the enemies of Muslims. This filthy call of theirs is a call from the people of mischief. The Muslim leaders or those responsible must work hard to find the source of this peril and stamp out this fire of evil. This despicable call is nothing other than a bridge to irreligion which we see dominant in countries afflicted with atheism and destined to misery. The [astute] believer does not get attacked from the same [lizard] hole twice. Wiser is he who learns from the mistakes of others. Allah speaks the truth and guides to the straight path. Why Cracking Knuckles is Makrooh??? For us as Muslims, Quran and Sunnah is sufficient to understand what is Right, Wrong, Good, Bad, Disliked and so on. Many times people wonder why there are such opinions when science disagrees or may say otherwise. As Muslims, Science holds very little value in the sense that it can strengthen our Iman but not decrease it no matter what science finds. Eventually, science can only eventually conclude the truth! Knuckle cracking is one of them. Science may say one thing (to follow with photographic evidence etc), Superstitious people will say another. I’ve personally heard myths that cracking the knuckles breaks the bones of the deceased of a close relative, SubhanaAllah, where do these come from and how can people believe such things. It was narrated from Anas ibn Maalik (may Allaah be pleased with him) that the Prophet (peace and blessings of Allaah be upon him) said: “There is no ‘adwa (transmission of infectious disease without the permission of Allaah) and no tiyarah (superstitious belief in bird omens), but I like optimism.” They said, “What is optimism?” He said, “A good word.” [Narrated by al-Bukhaari (5776) and Muslim (2224)]. It was narrated that ‘Abd-Allaah ibn Mas’ood said: The Messenger of Allaah (peace and blessings of Allaah be upon him) said: “Tiyarah (superstitious belief in omens) is shirk.” [Narrated by al-Tirmidhi (1614), Abu Dawood (3910), Ibn Majaah (3538); classed as saheeh by al-Albaani in Saheeh Abi Dawood]. The word tiyarah is derived from the word tatayyur, which refers to superstition about something that is seen or heard; or it was said that it refers to superstition about anything, whether it is something that is seen or heard, or a time or place. This is more comprehensive as it includes things that are not seen or heard, such as superstition about certain times. First the Salafi version (partially taken from here) clearly states that it is only disliked IN salah and not outside of Salah. What is the interpretation of the hadith that talked about cracking the knuckles? Is forbidden both during and outside prayers? Cracking the knuckles is makrooh whilst praying, not all the time. Rather it is makrooh during prayer, because it will either distract the one who does it from the prayer, or it will disturb other worshippers. The hadeeth that was narrated concerning that is not the words of the Prophet (blessings and peace of Allah be upon him); rather it is mawqoof and its isnaad ends with ‘Abdullah ibn ‘Abbaas (may Allah be pleased with him) and is his words. It was narrated that Shu‘bah, the freed slave of Ibn ‘Abbaas, said: I prayed beside Ibn ‘Abbaas and cracked my knuckles, and when I had finished praying, he said: May you have no mother! [This is a word of rebuke] You crack your knuckles whilst you are praying? Narrated by Ibn Abi Shaybah (2/344). Al-Albaani said in Irwa’ al-Ghaleel (2/99): Its isnaad is hasan. Shaykh Ibn ‘Uthaymeen (may Allah have mercy on him) was asked: Does cracking the knuckles absentmindedly whilst praying invalidate the prayer? He replied: Cracking the knuckles does not invalidate the prayer, but cracking the knuckles is a kind of fidgeting, and if that is during a congregational prayer, it will inevitably disturb those who hear it, and that is more bothersome than if there is no one around him. I have bad habit of breaking knuckles every few minutes. I cant control my self even in salah. Specially when i stand up after sajda, i automatically push my fingers against floor and also of knee joints. Please tell me will it affect my salah, and if yes, how can i control myself against this act. Translation: Ali (Radiyallahu Anh) narrates that the Prophet (Sallallahu Alaihi Wa Sallam) said: Do not crack your knuckles whilst in salah. The Fuqaha (jurisprudents) have ruled that it is makrooh (reprehensible) to crack ones fingers/knuckles in general and particularly in salah. Cracking knuckles in salah decreases the quality and value of ones salah. Furthermore, it distracts the salah of others as well. As Muslims we are advised to perform our salah to the best of our ability, and also be considerate to others. We advise you to exercise restraint in cracking your knuckles. Once you exercise restraint a few times, the bad habit will stop. Here’s what science has found so far – Remember, Our way is that of the Sunnah, not Science, so don’t take science as your answer. In a recent study published in PLOS ONE, a group of researchers found that cracking a knuckle forms a temporary cavity in the body, disproving a long prevalent theory that the crack is due to the collapse of a bubble. 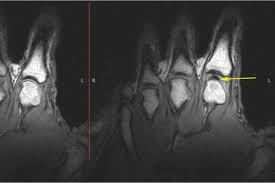 The study focused on the fingers of Canadian chiropractor Jerome Fryer, who has the ability to crack the knuckles in every one of his fingers on demand (not everyone can). He also has a particular interest in the science behind knuckle cracking. To observe what was happening when his knuckles cracked, Fryer inserted each of his fingers into a tube connected to a cable that was slowly pulled until his knuckle joint cracked. An MRI video captured each knuckle joint crack in real time. MRI video of one of Fryer’s finger joints popping. Pop goes the knuckle. The researchers observed the same phenomenon occurring in every one of Fryer’s fingers: when a joint separated and made the “cracking” sound, a gas-filled cavity formed within the synovial fluid, a slick substance that lubricates the joints. Images showed that before cracking, joints appeared normal and without any gaseous activity. But upon cracking, a dark void appeared. Fryer’s finger demonstration may help scientists better study joint problems, including arthritis and injury. Kawchuck said in the statement that the findings have implications for new research into the therapeutic benefit — or harm — of cracking joints. At the moment, there is conflicting data in research: Scientists have found that the force at which knuckles are cracked has enough energy to damage hard surfaces, but also that frequent knuckle cracking doesn’t seem to have any long-term negative effects. Kawuck and his team plan to investigate further. So what will you do, consider it as Makrooh – Disliked by Allah – or that it doesn’t really have an effect on you. Who knows better? Its obvious. Will you chance it and later find out in older age that it was a cracking error? or try to refrain from it altogether. There is wisdom into why some things are makrooh, its better left out! Crack the habit not the knuckle. ⚫ In such speech is some worldly or Deeni benefit. ⚫ In such speech is some worldly or Deeni harm. ⚫ Neither beneficial nor harmful. In Ihya-ul Uloom it is mentioned that a reckoning will be taken (in Aakhirat) of la-ya’ni (futile) speech. There is therefore no certainty that one will be saved from something which will be submitted to reckoning. The mujahadah of reducing conversation is more difficult than the mujaahadah of reducing food and reducing sleep. In eating, preparation to a certain extent is involved, moreover, there is a limit to food consumption. Indigestion due to excessive eating will in itself compel one to reduce eating. Similarly, there is a limit to sleeping. On the contrary, conversation requires no effort and difficulty is experienced in maintaining the tongue in operation. Man resorts to pleasures so as to experience delight and joy. Besides conversation, all other pleasures (huzooz) decrease in enjoyment with greater indulgence. Eating with a filled stomach does not bring about any enjoyment in the food. Excessive sleep too is not enjoyable. But, the enjoyment derived from speaking is limitless. In fact, pleasure increases the more one speaks. Hence, taqleel-e-­kalam (reducing conversation) is the most difficult In spite of this difficulty, freedom in it (i.e. in speech) has not been granted because of evils involved in abundant speech. One becomes greatly involved in sin because of speaking much. Reducing speech has therefore been stipulated as a rukn (fundamental) of mujahadah. Reducing speech does not mean reduction in such talk which is necessary. But, it means shunning nonsensical or futile conversation even if such talk happens to be lawful. If this habit is inculcated then abstention from haram talks such as falsehood, scandalling, slandering, etc., will be automatic. Abstaining from unlawful discussion comes within the scope of true mujahadah – mujahadah which is compulsory. If one becomes accustomed to refrain from idle (although it may be lawful) talk which falls within the scope of secondary mujahadah then to a far greater degree will one practice true mujahadah (i.e. compulsory striving) against haraam talk. It is not permissible to shun talk which is necessary since this will result in problems or cause inconvenience and difficulty to the audience. RECENTLY THERE WAS a heated debate in Israel on the question of the origin of mankind on earth. Dr. Shlomi Lesser of the Hebrew University and chairman of a society of atheist Israeli scientists had engaged ultra-orthodox rabbis on the issue of the origin of mankind. Surprisingly, the Rabbi supposedly an expert of the Torah and Yahudi religious history, was unable to debunk the myth and fallacy of the atheist scientist. In fact, the scientific theory which the atheist had propounded confirms the truth of mankind’s origin from a single pair of human beings. The scientist acknowledged, albeit grudgingly, that the “Adam and Eve story was plausible only if they were 90 feet tall”. This is exactly what Islam contends – that Hadhrat Aadam (alayhis salaam) was 60 cubits tall. A cubit is an ancient measurement of 18 inches or one and half feet. Thus 60 cubits equal 90 feet, exactly as the atheist scientist had calculated in terms of their scientific ‘bottleneck’ theory. The scientist also expounded that according to genetic evidence man would have been shrinking if he came from a single human ancestor. This is precisely stated in the Hadith that after the creation of Aadam (alayhis salaam), man continued shrinking until he reached his present size. The ‘obvious absurdity’ could be directed to the claim of the Yahudi Rabbi who had erroneously said that Hadhrat Aadam’s height was the size of today’s average man. The error of the Rabbi served a good purpose. If the Rabbi had been aware of the history of the Ambiya, he would have stated the correct height of Aadam (alayhis salaam). The scientist would then have resorted to chicanery and would have blindly and irrationally rejected the claim as a myth. But, now the scientist on the basis of his own scientific ‘bottleneck’ theory is stuck in a bottleneck. The scientist now has no scientific theory to dismiss as a myth the religious version that mankind originated from Aadam and Hawwaa (alayhimas salaam). Any rejection will be emotional and irrational, not scientific. Science has substantiated the veracity of the religious claim. “I am not going to quarrel on this matter. But you should look to yourself and ask “what have you given in service to consider yourself the one to point fingers?” While you sit here ranting about the Deobandis, you fail to realize what most of the big scholars of hadith like Shaykh Muhammad ‘Awammah, [Shaykh] ‘Abd al-Fattah Abu Ghuddah, and thousands of others have expressed in depths to the Deobandis about their great service in the science of hadith and fiqh. In fact as [Shaykh] ‘Abd al-Fattah Abu Ghuddah said, had it not been for them the science of hadith would have been lost in this last century. They have outstripped every nation in regards to hadith on the face of this earth. So clean the rancour from your heart. Not only in hadith have they done a great service but also in the field of fiqh. And while you sit here and claim they are “ghetto’ etc. they are the ones that have given the service to answer many modern day issues of finance etc. and yet they still disperse knowledge in a traditional manner. No madhab, not even us Malikis, can say we have come close in modern works in this century as they have done. So where is your gratitude for the service of knowledge? What have you done to criticize what these people haven’t done in your eyes? Furthermore, they have set up institutes of free education or at a very low cost throughout the world in less than 70 years. From Africa, Asia, and the West. In Camperdown South Africa, In’amiyyah has more foreign students than locals, from more than 25 countries, many of which are sponsored by them. I just met with a young Zulu ‘alim who converted to Islam memorized Qur’an and finished the alim course last week, while he came back to visit the madrassah. Face it whether in Europe or North American when it comes to memorizing Qur’an who’s doing the work? Who are the ones standing there reciting the Qur’an from beginning to end not looking at the mushaf? Its not the Arabs nor the Europeans but 9/10 it is an Indo-Pak from Deobandi madrassahs. You have to accept that anything that spreads across the world is not going to remain perfect, that is expected. But there service to the deen is unquestionable. It is clear you have some rancour in your heart towards them, adding to the fact that your fatwa claiming that women should not veil is because it resembles the Salafis and those like them, which you stated were Deobandis in spite of the fact that they are generally Ashari or Maturidi who believe without a shadow of doubt in following a madhab. In reality that is nothing more than slander. Don’t be upset because they have their way of doing things. They are not bound by your principles nor mine. Give respect where respect is due. Their contributions have lead to preserving the Sunnah of the deen and the teachings of hadith with undoubted sanad. I love and honour them if only for that but not blind of their pitfalls.